The New Zealand Food & Grocery Council (FGC) is an industry association that represents the manufacturers and suppliers behind New Zealand’s leading food, beverage, and grocery brands. Food and beverage manufacturing is the largest manufacturing sector in New Zealand, representing 44% of total manufacturing income. Our members represent more than $34 billion in domestic retail sales, more than $31 billion in exports, and directly or indirectly employ about 400,000 people, or one in five people in our workforce*. 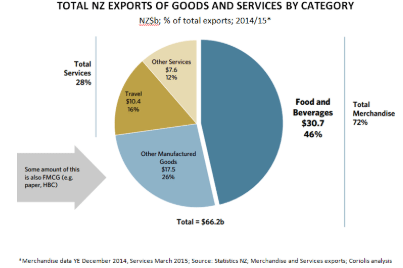 The $31 billion in exports was 60 per cent of New Zealand’s total merchandise exports of $52 billion in 2017 to 196 countries. FGC promotes the role the industry plays in the health and nutrition of New Zealanders in making better diet and lifestyle choices. It advocates on issues of concern and interest to the industry, and acts as a forum to discuss and pursue those issues. FGC acts as a voice for our members and makes representations to the Government, retails, and other relevant organisations on issues that affect the industry. We have experience in all components of the advocacy process, including presenting before select committees, legal analysis and personal contact with relevant Government Ministers. We liaise with government departments – such as the Ministry of Primary Industries, Food Standards Australia New Zealand, Ministry of Health, and the Environmental Protection Authority – on food legislation, trade practices, and environmental issues, working where necessary with a range of stakeholders, including from the fast-moving consumer goods industry and NGOs. We also work closely with other industry organisations where there is commonality of interests, such as BusinessNZ. We take a leading role in developing industry standards and codes of practice and have been involved in topical issues such as coupons, pallets, ullage and product recalls. At all times, FGC promotes the facts about safe food and good nutrition using an evidence-based approach using help from experts in their field as necessary. To conserve, promote, and advance the interests of manufacturers and suppliers of food and non-food products sold by the grocery trade. To liaise with government departments, statutory bodies, and other people and organisations in promoting the interests of members. To disseminate information affecting or of interest to members. Provides a forum to discuss issues of concern and interest to the industry. Makes representations to government and other relevant organisations on matters that affect the industry. FGC regularly liaises with departments such as the Ministry for Primary Industries, and the Ministry of Business Innovation and Employment (combining the functions of the former Ministries of Economic Development, Science and Innovation, and the Departments of Labour, and Building and Housing), the Ministries of Consumer Affairs, Environment, Foreign Affairs and Trade, and Health on issues such as food legislation, trade practices and environmental issues. Presents submissions on legislation and government reports on issues that have implications for the industry. Liaises with other sectors of the trade. FGC pursues issues of common concern on members’ behalf. It acts as secretariat for the Food Industry Forum, which comprises a representative from each sector of the food industry, and has representation on the boards of GS1NZ and ECR Australasia. Industry Codes of Practice are drafted as and when necessary. These Codes include product recall, coupons, merchandisers, packaging, and environmental claims. FGC members sit on various industry forums and groups. These include: Grocery Industry Council, Food Industry Group, Health Star Rating Advisory Group, BusinessNZ Affiliated Industry Group, MPI Food Industry Representatives Forum, Food Standards Australia New Zealand Retailers and Manufacturers Forum, Hazardous Substances Industry Liaison Group, Codex Advisory Group, APEC Business Advisory Council, Dairy Product Safety Advisory Committee, International Council of Grocery Manufacturer Associations, Brexit Advisory Group, Trading Partner Forum, Consumer Goods Forum.